A centerpiece is an important piece of art that should express the theme of your wedding or event. According to Brides Magazine, guests will spend an average of 3-4 hours sitting at their tables! That leaves plenty of time for them to check out what’s in the center, so, let’s give them something to talk about! From glamorous to casual, we have a centerpiece idea to fit your fete! Check out Part 1 now, then wait patiently for Part 2 (I promise, I won’t make you wait too long)! 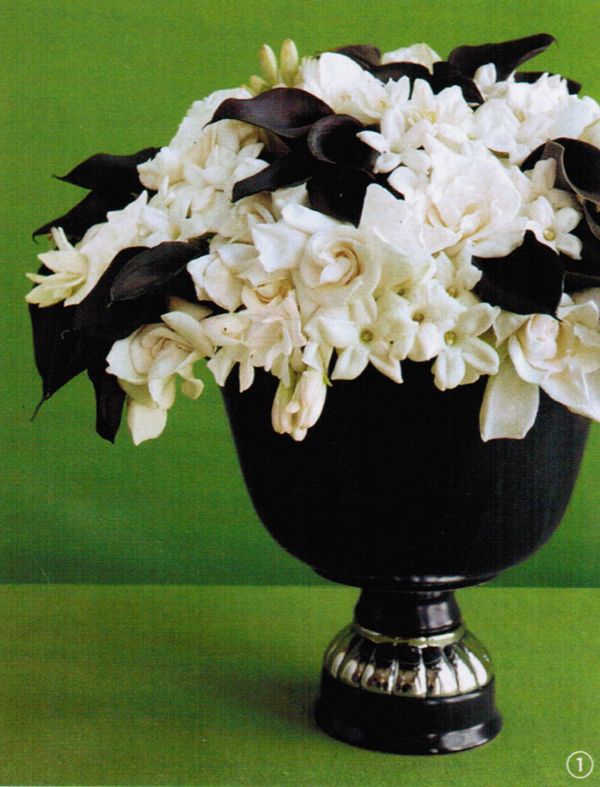 A glamorous arrangement of black calla lilies, stephanotis, and gardenias in a metallic accented urn gives you a sweetly scented and completely attention grabbing look that any old-Hollywood star would desire. Container, mud-pie.com. If you love the outdoors and have a rustic, laid-back vibe, then this one is for you! 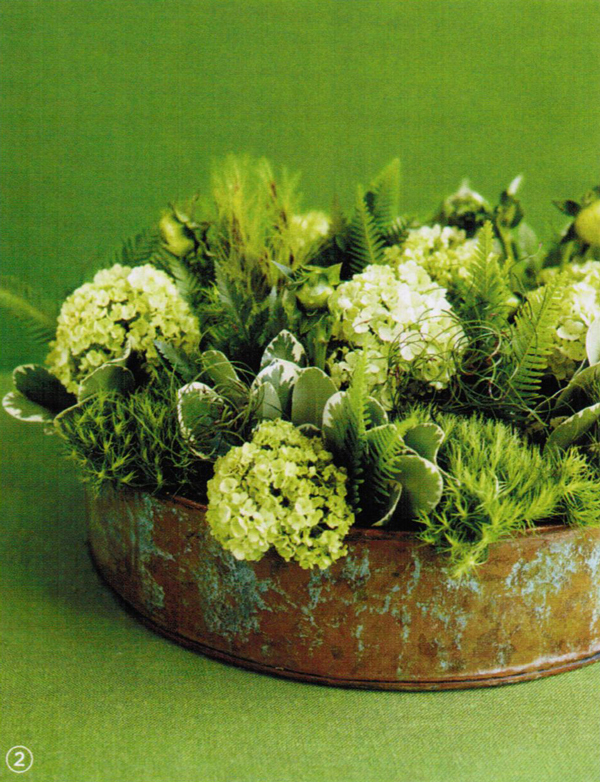 A lush arrangement with 3 types of ferns (umbrella, leather, and koala), dahlia buds (closed so they are still green) and dianthus give this green-on-green arrangement a texture that’s as fresh as the forest floor. Cooper-patina tin, jamaligarden.com. 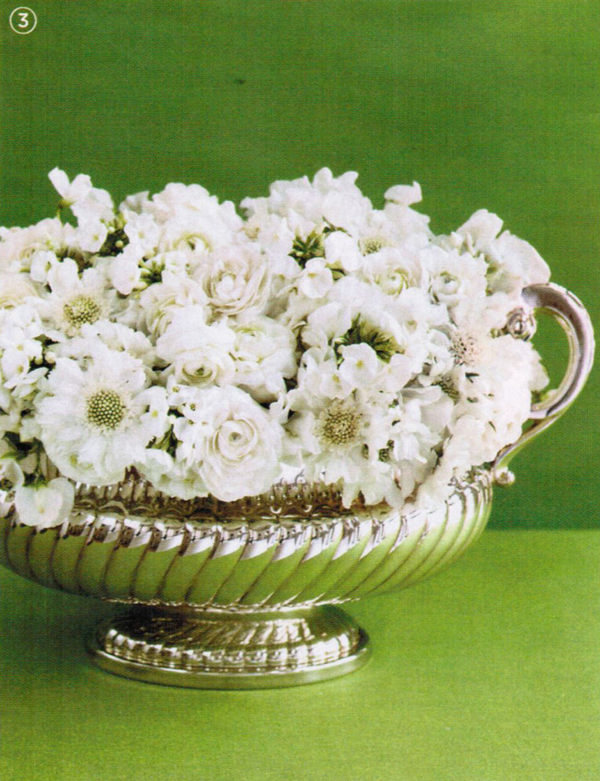 Formal and classic, this beautiful white arrangement pairs sweet peas, baby’s breath, ranunculus and scabiosa all tucked inside a silver urn. This timeless display is sure to get people talking. Silver container, fesilver.com. Special Thanks to Lexi Dwyer of Brides Magazine, Florist Elisabetta Urioni, and Photographer Alison Rosa.